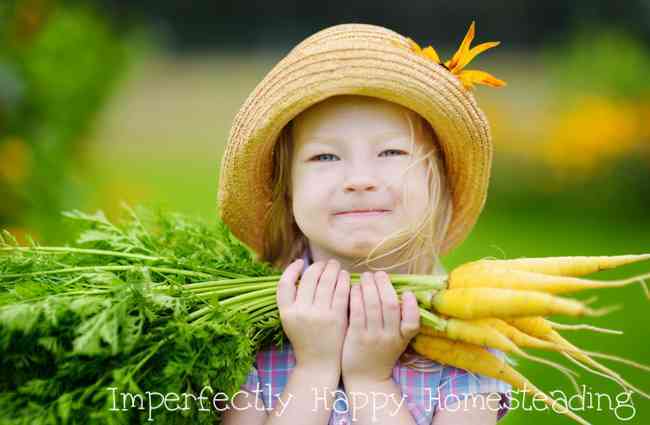 10 Fantastic Reasons Why Kids Should Garden and Start Today! Kids should garden – every kid. My youngest has always been my garden helper and I have seen many benefits over the years to her helping and being in charge of her own garden. Kids should garden because they get so much from it. 1) Kids Should Garden – because they are a lot more likely to eat the fruits, vegetables and herbs they grow. This is something I’ve seen in my own children; when they grow greens, they eat greens. 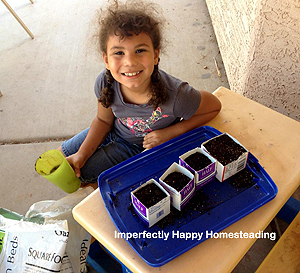 2) Kids Should Garden – because they learn a life skill. Learning how to garden and grow food will offer kids a lifelong skill of providing for themselves. My youngest, a few years ago, starting seeds in milk cartons. what it takes to grow food they are less likely to waste it. I have seen this in adults too but kids have a new way of seeing food, even when they haven’t grown it, once they’ve had a garden. 4) Kids Should Garden – because it gets them away from “screens”. We live in a modern world and I know that children need to know how to use it. But they often spend more time in front of screens (phone, tablets, tv, computers…) than in nature. 5) Kids Should Garden – because it creates more family time. Assuming that the parents or guardians are also gardening, a garden that kiddos help in will create more family time. What’s better is that this family time won’t be interrupted with screens for parent or child. Time to connect and chat! 6) Kids Should Garden – because future generations won’t lose this skill. By teaching our children the art of gardening we hope to create a love for it; and a love that will continue to be passed on for generations. 7) Kids Should Garden – because they’ll get some exercise. I’ve read some shocking statistics about the health of this generation; some even suggesting that this generation may be the first to live a shorter life than their parents. Getting kids out to garden will work some muscles and if you let them do all the digging, building and such, they’ll get that heart pumping too. 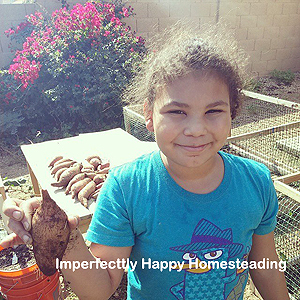 Her first sweet potato harvest from her own garden! bring education into our activities; and gardening is science. From seed growth and photosynthesis to how the soil is alive. Older children and teens might enjoy Gardening for Geeks as a text. For younger children check out this free gardening curriculum. Don’t forget the math of planning a garden and figuring cost of growing vs buying at the store. 9) Kids Should Garden – because they learn to solve problems. We all know that no garden has ever grown without some beginner issues. Even the failures help kids because they can learn how to fix them. Either because you are showing younger kids how to avoid problems are asking older ones to research issues and solve them on their own. 10) Kids Should Garden – because it gives them a sense of pride. You won’t believe how a child lights up when you serve a salad full of veggies from their garden! There is a real sense of accomplishment and pride that comes from providing food for your family and friends. Not to mention they learn how to give to others as they offer their hard work up for others. BONUS Kids Should Garden – because it is just so stinking fun!!!!! This is fantastic! I am an avid gardener, and agree with you on every point of this post. We have five children, and I have seen first-hand the (great) effects of gardening on children! I hope our little ones continue to love it throughout their lives and pass it along to their own children. I tried doing this with all 6 of our children for many of the reasons stated above. It may not have worked as well as I had hoped then because 1) we live in a city and 2) their father made it an onerous chore. Although when I grew a lima bean trellis in the back yard the neighborhood children (teenagers) were very inquisitive and the next year they all tried to grow something. Now I have a few of my children who are now asking for advice on how to start their own gardens or are willing to help me with mine. They all want to learn how to make jams, etc. Even if it seems like you aren’t connecting with them, your actions have a big impact on them.